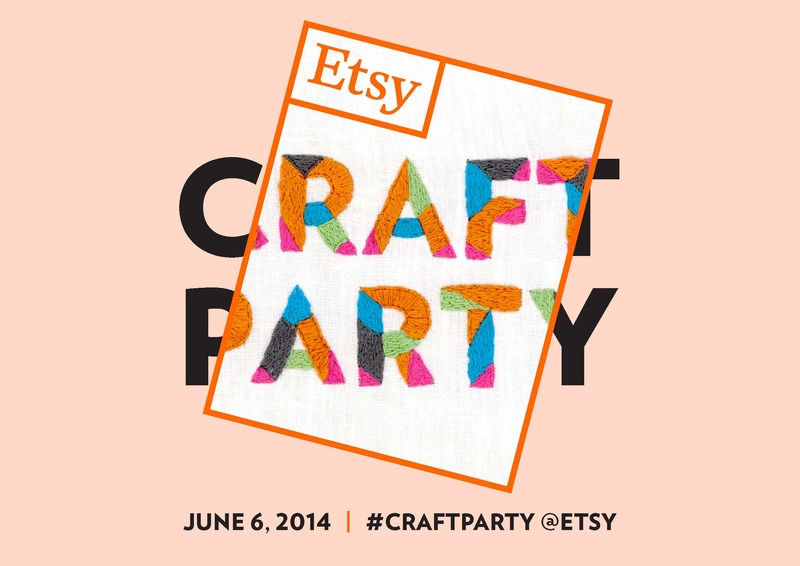 Etsy invites everyone to arrange a local party and craft the day away. This year the #craftparty (official hashtag of 2014!) was held on Friday, June 6th. The theme was Recapture Photographs! What can you make when you take photos and alter them in some way? Lots of very crafty ideas apparently! Team Christmas in July decided to do a virtual party via the CIJ blog and boy was it fun!! The first was a Patchwork Paper Shadowbox that was a way of showcasing your photos around other objects. She then showed us to make handmade coasters that I want to try! Lastly she made a Altered Photo frame that was very shabby chic! Decorating your tree with photo ornaments! It is super fun involving photos, glue, jar lids and lots of creativity! 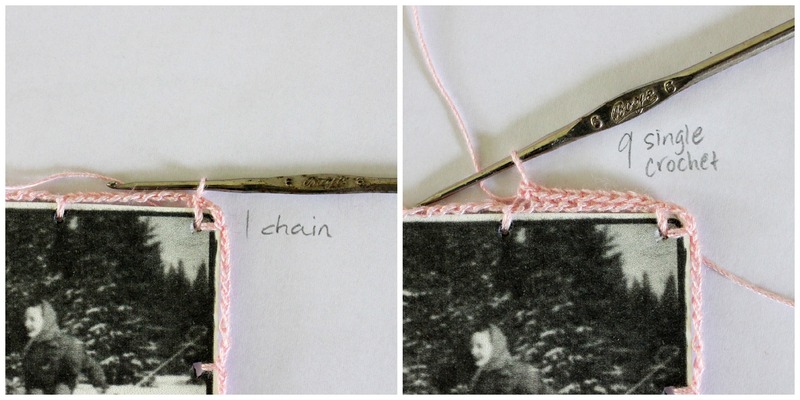 How we can crochet an edge on paper. It has a lot to do with slip stitching and concentrating! Looked so lovely and fun! We had swag bags made of all types of printable goodies! One of our little thank you’s for being there! We had posts galore on all types of social media ranging from facebook, twitter, pinterest, google + and more! Some of our members even had a Craft Party sale using the Code CIJPARTY14! Finally we also had some members donate prizes to some lucky winners who entered our Rafflecopter Giveaway! I want to thank everyone who participated in this especially CIJ captain Michelle and my co-chair Jennifer! This was an amazing event and one I want to try again! Hello again everyone! Are you enjoying our day of classes here at the CIJ #craftparty?? Next up is our Altered Photo Frame class, and this one is fun and easy. Honest. 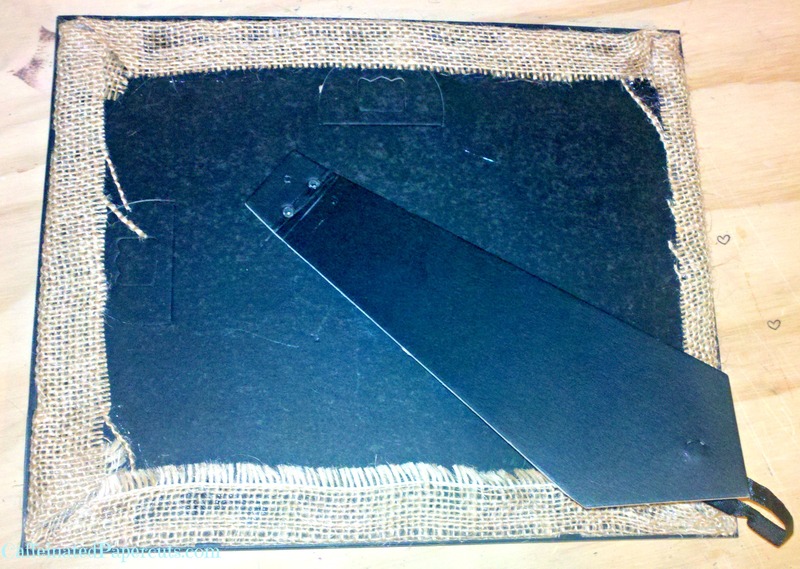 Start by taking apart your photo frame and removing the glass. Toss it, break it, use it as a sun catcher; we simply don’t need it for this project. Cover the back of the frame with burlap and hot glue in place. 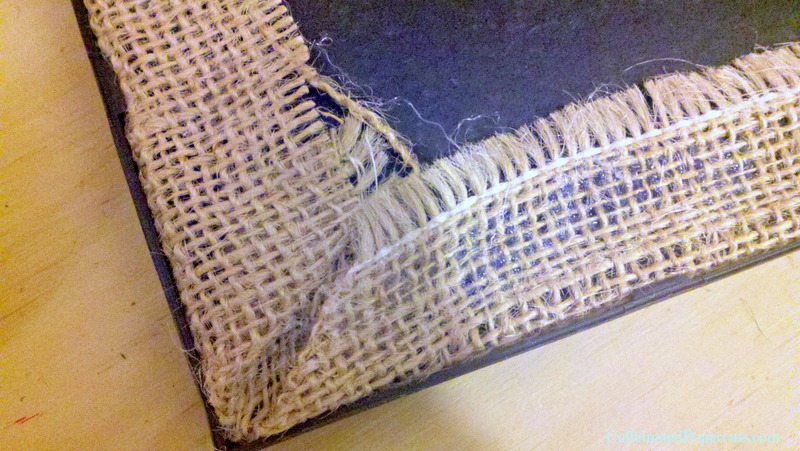 Warning – burlap has holes in it. Hot glue is hot. Just saying. When you’re done, the back of the frame should look something like this. 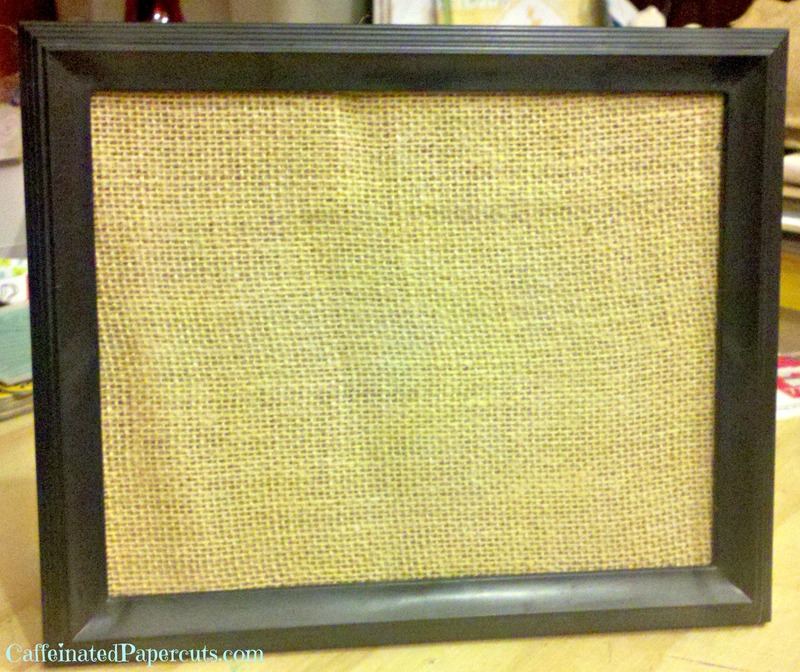 Feel free to trim down any extra burlap if you wish, and then glue down your corners. I pulled in the corner piece, glued it down, then folded the side pieces over the top to make the whole thing nice and snug. Let the whole thing dry for a bit, then pop it back into the photo frame. Make sure it will fit with the added bulk (it really should), but don’t squeeze everything into place yet; we’re going to add our twine string for hanging our photos in first. 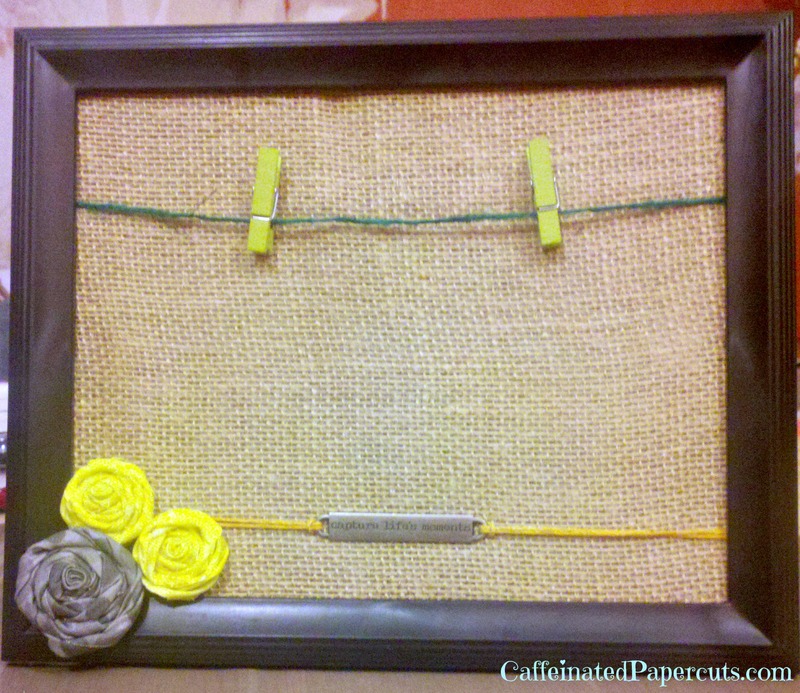 Feed your twine from the front, between where the photo frame and burlap with meet, to the back of the frame. Once you have it at the height you want, glue the first end down. Let it dry for a moment, then feed the other side through as well. 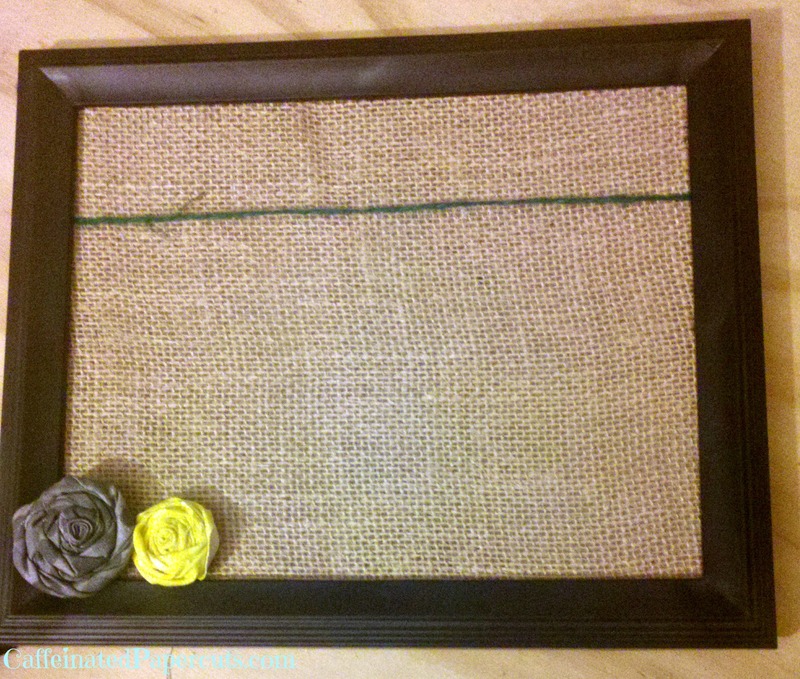 Glue it down and you now have a burlap frame that will proudly display your photos. The clothespins make it simple to switch them out. I decided to dress mine up further and glued on some fabric flowers, then finished it off by stringing a metal sentiment plate across it using the same technique as the twine. It appropriately reads “capture life’s moments”. Thanks for stopping by the class! Be sure to check out the main Craft Party page for the full schedule of events. “Growing up, we loved going to a tree farm and picking out the perfect Christmas tree. (Or not so perfect. I have fond memories or trudging through the snow with my brothers, cutting down a tree, and dragging it through the field. It’s a good thing I had strong brothers. After the tree thawed, it was time to decorate it. We covered it in decorations that my parents collected through the years. In a way, the Christmas tree became a “scrapbook” of sorts. My family’s tree (as I was growing up) was filled with ornaments from “baby’s first Christmases”, trips that we took, activities that we did, like music, dance, and sports ornaments. My parent’s liked having photograph ornaments made. They had a wedding one made of themselves, and had photo one’s made for each of the children for our first Christmases. My mother also always made it a point to keep every ornament we ever made. The Christmas tree had beautiful glass ornaments on it, along with a few popsicle stick snowflakes. She still hangs our handmade photo ornaments that we made in grade school. Both of my parents also kept ornaments from when they were kids as well. 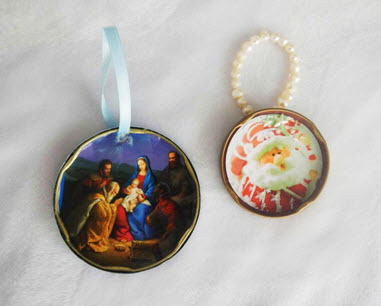 Learn how to make your very own photo ornaments with your kids this Christmas! Make a hole by hammering a nail through the lid. Do this on a safe surface (I used a craft board) so as not to damage floors or tables. *SAFETY* Do not let children do this step. 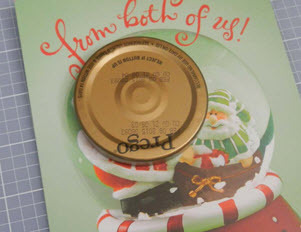 Keep the little ones away when making the holes in the lids. 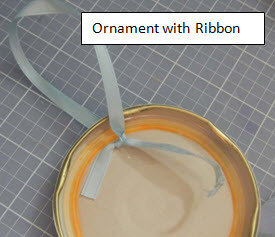 If you wish to add paper to the back of the ornament, this is the best time to do it. Simply trace the lid on the paper you wish to add to the back and glue it to the back of the lid. After the paper is added, poke a hole through the paper in the same spot the hole is on the lid. You can use a number of materials to make your hanger. 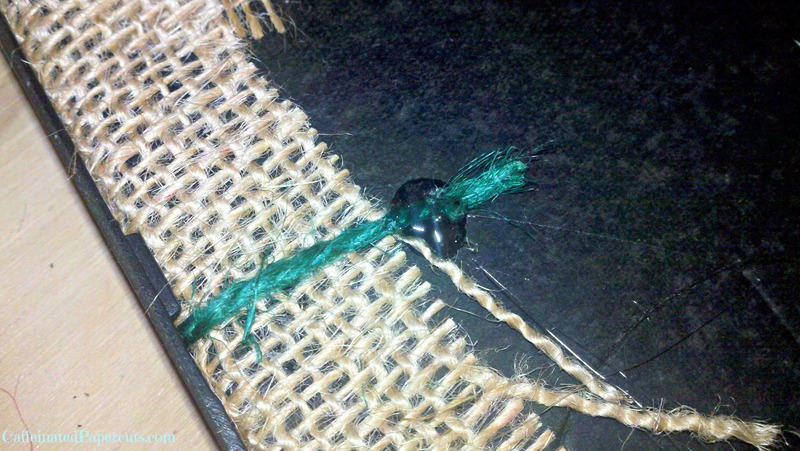 I chose to use ribbon for one of my ornaments, and a string of beads for another. 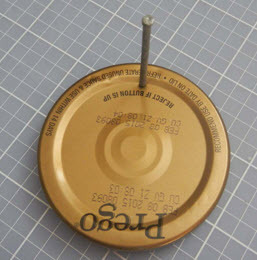 String the hanger through the hole in the lid. 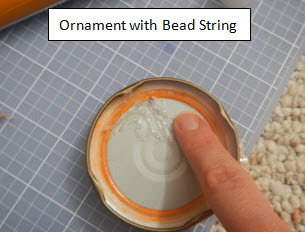 Tie a knot, and glue it in place on the inside of the lid. Trace the lid on a card, a photo, or colored paper. 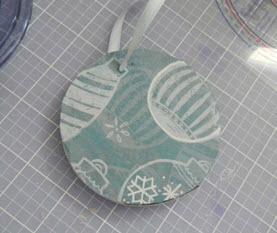 For my Santa ornament, I first added some dark red scrapbooking paper inside the lid; then I used the Santa card to cut a smaller circle. 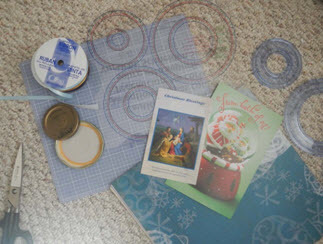 You can layer paper, or you can cut out just the picture and add it to the lid. Now, add any extra embellishments that you wish. I used some tiny star stickers to add to my Santa ornament. I think it gave him a little extra sparkle and charm. If you were making a paper covered lid, cut a long thin strip of paper and glue it to the outside edge of the lid. Don’t forget to add dates to the back! Many thanks to Ida from HerterCrochetDesigns for sharing her family’s Christmas tradition with us and for the wonderful tutorial! Be sure to check out our class schedule for today’s Craft Party on our main party post. If you absolutely must use an inkjet printer, use matte cardstock and let the prints set for about an hour. Then spray the paper with a matte finish sealant (Krylon makes a great one) to lock in the ink. Wait the required drying time, then spray them again. Trust me, your ink is going to run otherwise. So, how did we make them? 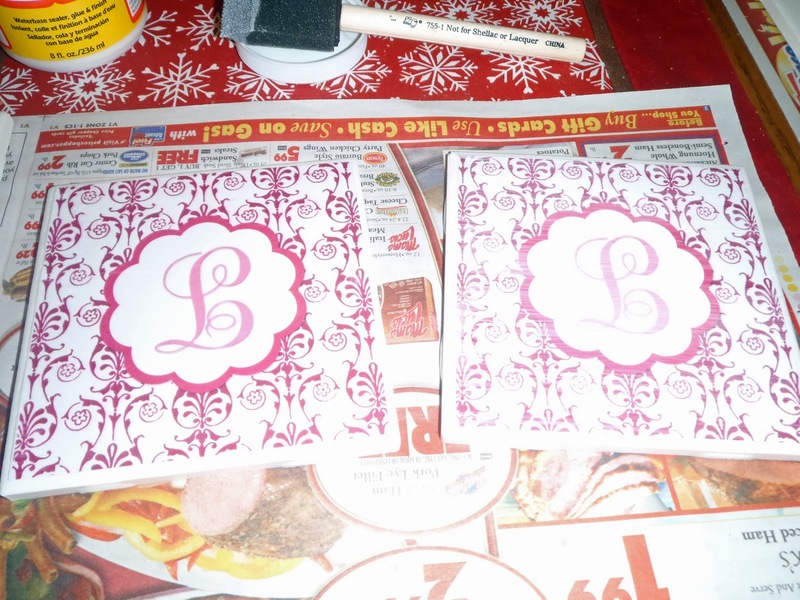 Trim up your paper to 4″x4″ and set aside. 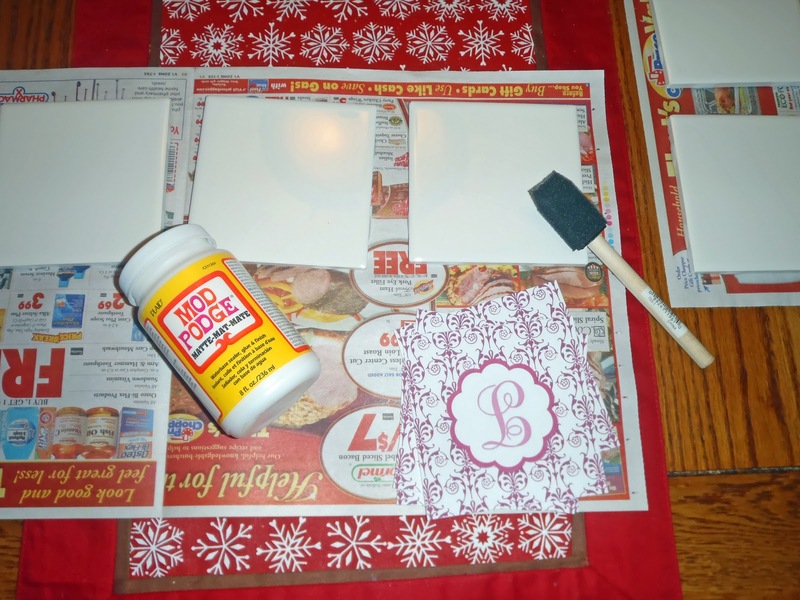 Lay out your tiles on a covered surface and get your Mod Podge ready. Lightly coat your first tile with Mod Podge and carefully lay your paper over the top. Smooth it out to remove all the bubbles and set aside to let dry. I typically flip the tile upside-down so that the image is on my table; it helps keep the bubbles out. Once dry, give them a second coat of Mod Podge. Since using a foam brush will leave slight brush marks, apply this coat in the opposite direction of the first. So, if the first coat went on left to right, turn your tiles 90 degrees before applying the second coat. Once that coat is dry, spray them all with the spray Mod Podge to give it a sealant against spilled liquids…coasters do seem to attract those. (ba-dum-bump) Once everything is dry (we let them sit for a day or so), apply the felt circles on the bottom to give them that non-skid goodness we expect from coasters. Ta da, beautiful handmade coasters that don’t break the bank! If you’re Photoshop-savvy, here’s how you make the custom artwork: open a new file and size it to 4″x4″. Let your creative self go crazy! You can fit four printouts on a standard letter-size sheet for printing ease. I used a lightweight cardstock and I would not recommend going heavier. Where did I get the idea for making coasters? Pinterest, of course! 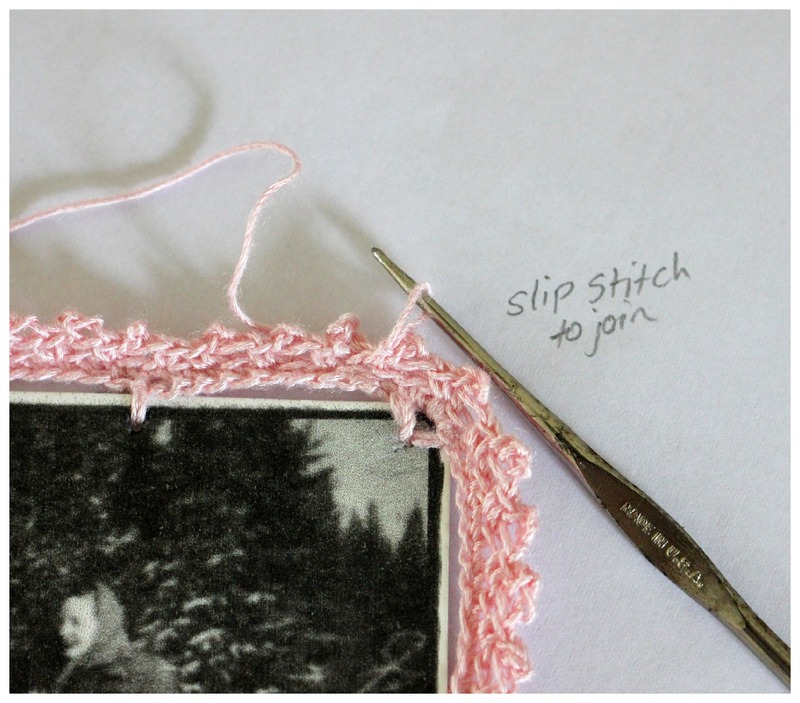 I am truly loving that site…all crafters should hang out on there. Feel free to follow my boards on there for inspiration of your own! If you do make coasters, please let me know so I can see how they came out. Thanks for stopping by the Handmade Coasters class today! Be sure to check out our full class schedule on the main Craft Party post. Hi! 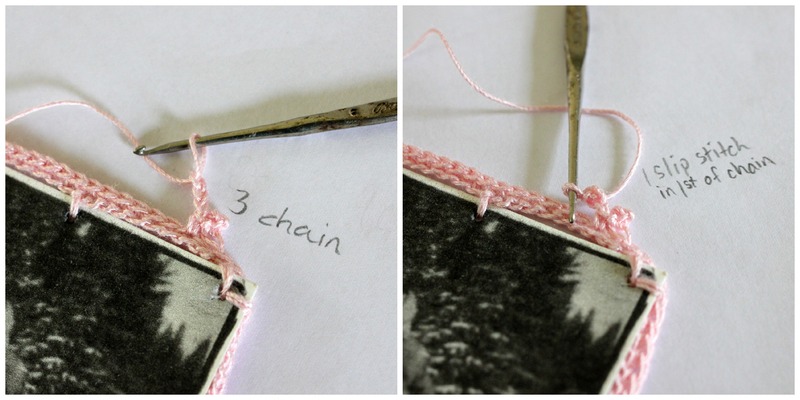 I’m Jessica from Crochet Nature and I’m happy to be here at the CIJ Blog sharing my tutorial for how to crochet an edge on paper. 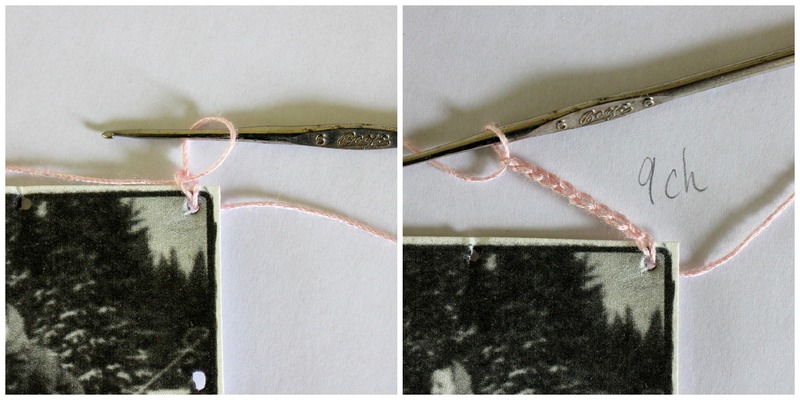 It’s one of the many ways you can embellish your pictures for the Etsy Craft Party! Thick Paper – Watercolor, Cardstock, etc. Step 1: Print pictures onto paper. 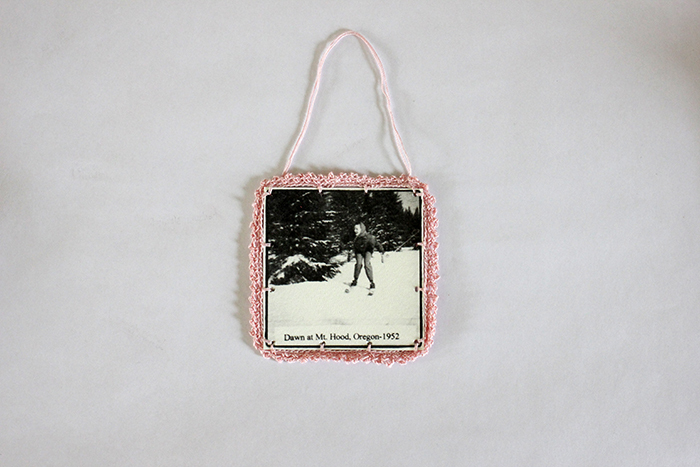 I chose some of my Grandma – the one of he skiing always makes me smile! 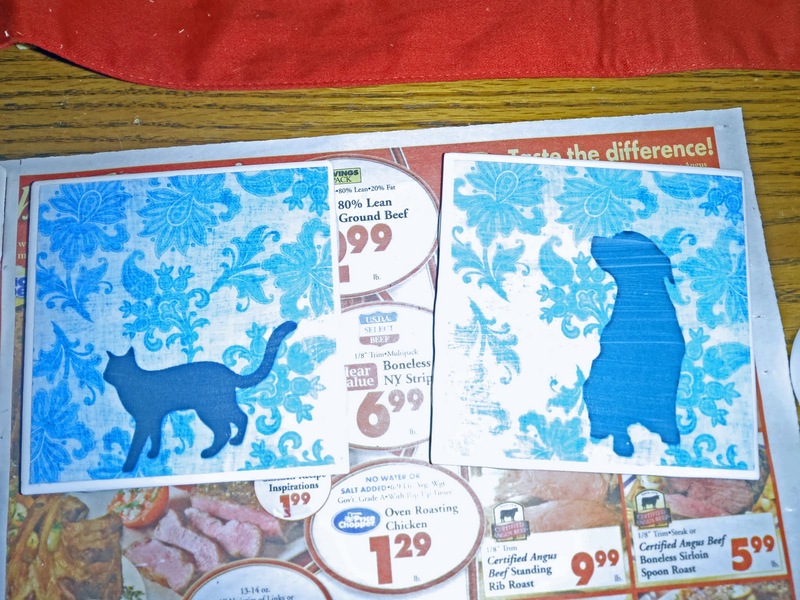 Step 2: Cut picture out. Step 3: Punch holes, evenly spaced, around edge of picture, about 1 inch apart. Step 4: Slip Stitch into corner where you would like to begin. Step 6: Slip Stitch into the next hole. Step 7: Repeat step 5 and 6 across edge to corner hole. Step 9: Slip Stitch into same corner hole. Step 10: Repeat Steps 5 to 9 until you reach the beginning stitch. 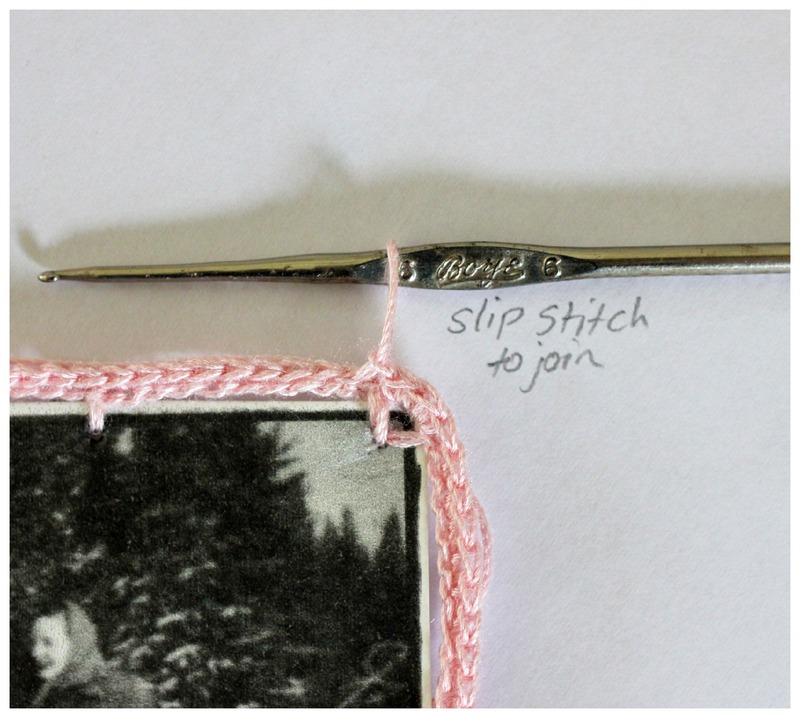 Step 11: Slip Stitch to join with beginning stitch. Step 13: Single Crochet in next 9 stitches. 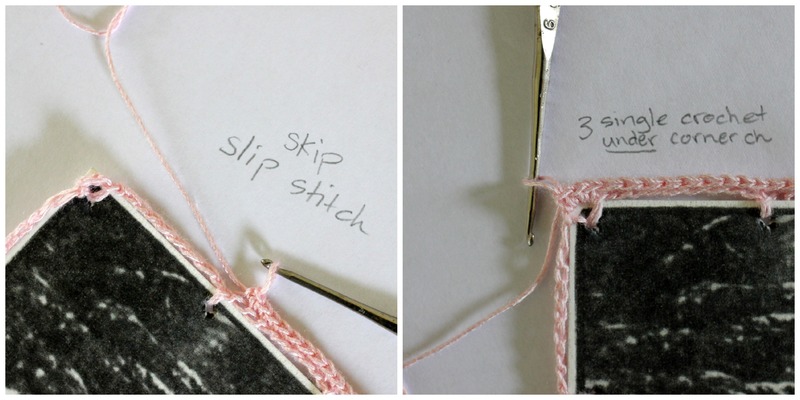 Step 14: Skip slip stitch. Single Crochet in each chain across the edge, skipping each slip stitch until you reach the corner. Step 15: Single Crochet 3 under corner chain. 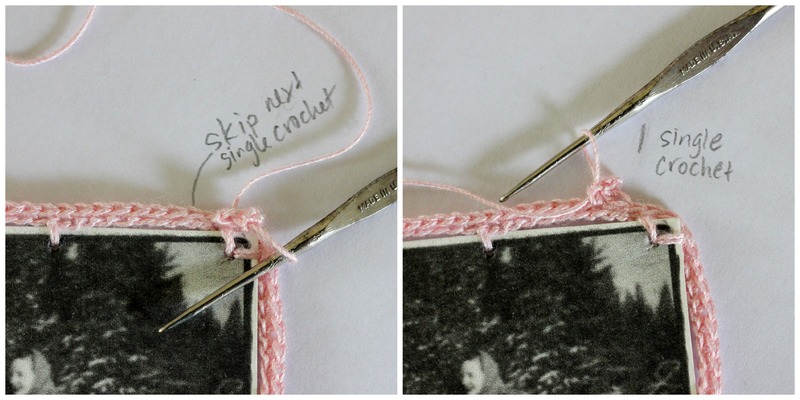 Continue single crocheting around entire picture with 3 single crochets under each corner. Step 16: Slip Stitch to join with first single crochet. 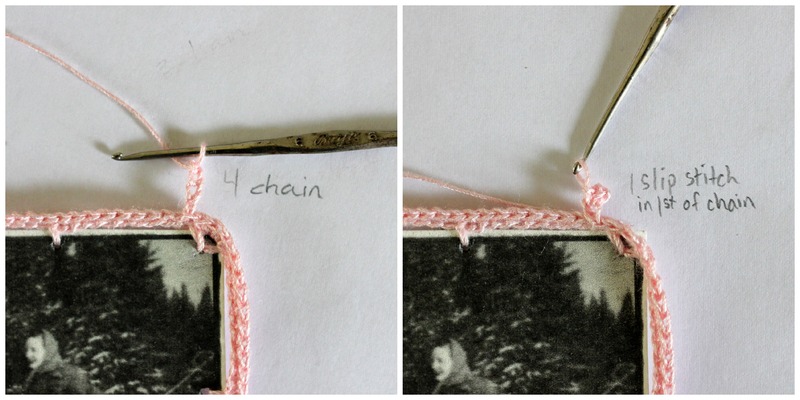 Step 18: 1 Slip Stitch in 1st chain of 4 chain. Step 19: Skip the next single crochet. Step 20: 1 Single Crochet in next stitch. Step 22: 1 Slip Stitch in 1st chain of 3 chain. Step 23: Slip Stitch to join with first stitch. Tie off. If you’d like to hang the picture, you can leave a long tail and tie it to the other side of the top edge. I hope you enjoyed my tutorial and I’d love to see you soon at my shop! Good morning! Welcome to our first class today, Making a Patchwork Paper Shadowbox. Wall art is a great way to get your photos out where you can see them, and making a shadowbox is a really fun way to do just that. The patchwork part refers to the patterned papers I used; I cut and sliced many different pieces to make my own background, sort of like piecing a quilt together. Paper pads are fabulous as you can find them in any color or theme under the sun and if it’s in the pad, it matches. They make it so easy! Yeah, that is one seriously cute, Goldfish-encrusted grin. My little love. That photo happened when he decided to come stick his face in the camera, so I clicked away. Who knew it would turn out so perfect? Ok, on to the photo montage of how I put this bad boy together! I started with the photobox frame which, in this case, measures 13″x13″, leaving me a workspace of 12.5″x12.5″. Lots of room! So I grabbed a piece of 12″x12″ paper I had lying around in a color that I really wasn’t crazy about and used that as my backer piece. I decided to make a patchwork quilt out of the different papers in the pack, so I started laying out my design then got cutting. Figuring out spacing BEFORE cutting. Sometimes I’m so smart! I really, really like how it came out. That’s the nice thing about paper stacks – all of the papers compliment each other. Thanks to the patterns, I could even work in some of the pink papers despite it being a boy’s layout. It came across as cool, not girly. Rock on. From here I moved on to the muslin bag. It really didn’t match in its natural form, so I grabbed my Distress Inks and started layering them on. I tucked tissue paper inside the bag to prevent bleed-through and it provided a cool effect while rubbing on the inks. I have to say, that little bag loved the inks! Soooo easy. When I was happy with the colors, I grabbed the crown stamp I had that, gasp!, matched the crowns on the paper perfectly. Using the rhinestones as jewels was a perfect way to bring some bling in. I let the bag dry overnight and did wind up going back over the crown with my marker as it had faded too much. I love how grungy it came out! Since I already had my marker in hand, I added my little prince of a rock star’s name and called it done. Oh yeah, the bag wasn’t the only thing stained…blech! While the bag dried and I scrubbed my hands clean (surprisingly easy to do, by the way) I chose and printed out my photos and got to work matting them. I also attached my “guitar strings” and buttons while munching on the hidden stash of candy in my craft room…shhhh! I laid everything out on my background and realized something was missing. In the end, I grabbed one last piece of paper from the stack and fussy-cut the flocked heart design out and added it to the middle. Perfect! From here it was simple. Grabbing my ATG gun I glued everything down. I used foam tape to pop up the photo in the corner and the heart embellishment to give it some dimension. Then it was just a matter of lining it up in the frame, adding the bag, and I was done! Thanks for stopping by my shadowbox class! Be sure to check out our full class schedule for today’s Craft Party on our main party post. Good morning everyone! Welcome to the CIJ #craftparty here on the CIJ blog! We wanted a way to party with all of our team mates and followers around the globe, so we took this party virtual. Besides, what better way to attend classes, get swag bags, and win prizes than from the comfort of your couch? This year’s theme is Recapture Your Photographs, so that’s what we’re going to do; get them off your camera, hard drive, phone, wherever you have them stashed and out where people can see them! Let’s face it, besides the food and the friends, the best part of the party is the goodie bag! We’ve pulled together a fun download bundle of projects and printables as a ‘thank you’ for stopping by today. Click here for your Swag Bag! 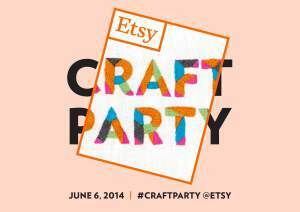 The official hashtag for this year’s party is #craftparty and if you’re partying with us today, we’d love to see! Be sure to tweet, Instagram, and/or Facebook us your projects. 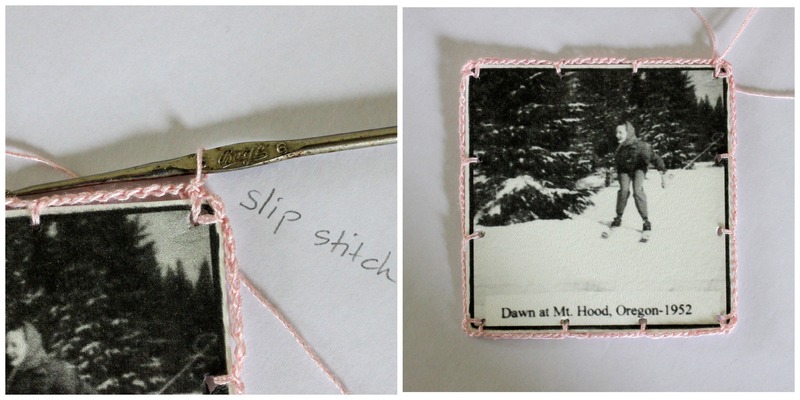 Go on, show off your crafty self! Still with me? All right, one last piece to this party; prizes! Toss your name into the hat below for your chance to win one of prizes offered up by our fabulous sponsors. Contest ends at midnight EST and the winner will be announced Monday on the blog!